Safe Kids Larimer County is a partnership of hospitals, healthcare organizations, police, fire, EMS, parent groups, and private individuals committed to preventing childhood injuries, the leading cause of death among children ages 19 and younger. We are a member of Safe Kids Worldwide, a global network made up of over 600 coalitions in 17 member countries. 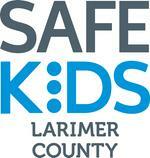 Safe Kids Larimer County was established in 1999. Bicycle Helmet Distribution – For a $10 donation, we are able to provide bicycle helmets to anyone who needs one. We have multiple distribution stations throughout Larimer County where families can go to get fit for a helmet. Please call 970.495.7502 for more information. Car Seat Education & Distribution Program – Through this program we are able to offer low income families new, safe car seats that are appropriately sized for their child. All we ask is they attend a one hour class that goes over laws and best practices from infant through booster seats, how to properly install a car seat and how to appropriately fit a child in each sized car seat. At the end of the class, they receive the seat. Hospital Fit Station – 70% of families leave any given hospital with their newborn inappropriately restrained in their car seat. Our goal with this program is to reduce that number to zero. Our trained car seat technicians provide 30 minute appointments with families while they are still a patient on the Women’s Care Unit at Poudre Valley Hospital and Medical Center of the Rockies. These appointments are hands on opportunities for the families to check on or install the base in the vehicle and put their new bundle of joy into their car seat for the first time. Safety Presentations – Whether it is to children, families, employees or friends – we offer presentations on a multitude of safety topics. Presentation lengths vary and can be catered to the type of presentation you need. Topics include car seat safety, medication safety, bicycle helmet safety, seat belts and distracted driving and home safety. Please give us a call at 970.495.7502 or email safekids@uchealth.org for more information. Strap & Snap Presentations – Safe Kids and our partners offer 45 minute presentations on bicycle helmet safety to 3rd graders in Thompson and Poudre School District from March – May. We usually reach between 2,000 – 3,000 students with our message! For more information, please contact the Safe Kids office at 970.495.7502. Meetings are from 9:00-10:30 a.m.